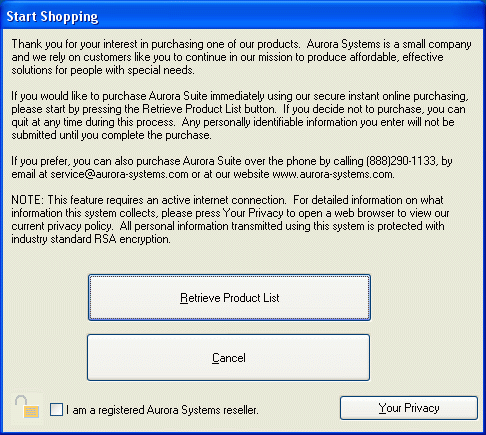 The first step is to use Start Shopping to retrieve the current product and price list from Aurora Systems Servers. Note: An active internet connection is required to use this service. Push this button to connect to Aurora Systems over the internet and retrieve the current product and price list. A status window will appear to let you know how the download is proceeding. If you are a registered Aurora Systems reseller and have a reseller ID and password, and you want to purchase a product using ASOS, check this box so that you will be prompted to enter your ID and password.